Now I’ll slowly extend the code, and just by eyeballing it, see if you can predict what the output will be before looking past the end of the PL/SQL block. So far so good I imagine. The parameter came in as zero, we incremented the global variable which of course had no impact on the parameter. Let’s now up the ante a little. but that is not the same as saying that the parameter is fixed in value throughout the duration of the call. 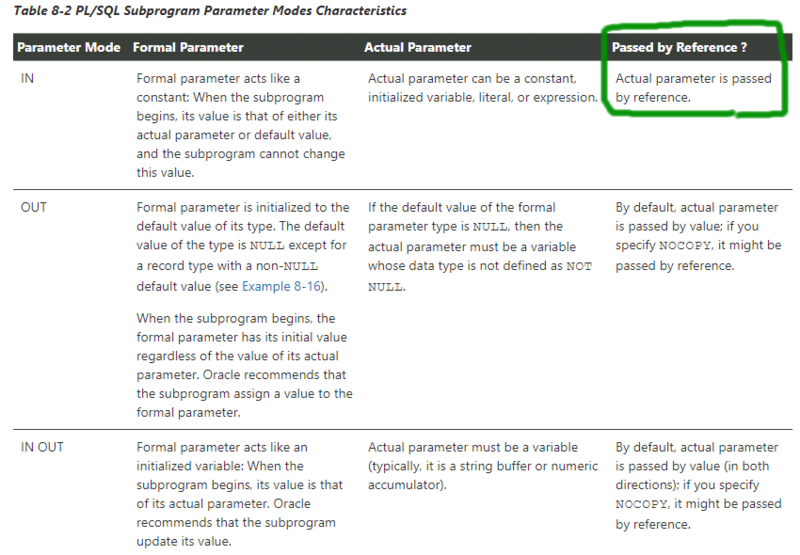 This behaviour is documented in the PL/SQL language manual in that an IN parameter can be passed by reference rather than a static value. Now I’ll explore some other examples of how you might get caught out by this. I’ll modify the example just slightly now so that I’m passing an expression rather than just “glob_var”. Now “normal” service has been resumed, in that the expression is evaluated first and hence is passed by value to the procedure leaving the parameter value unchanged throughout the procedure. Notice the last one in particular. Even though I had a TO_NUMBER expression around “glob_var”, it was still passed by reference and hence the parameter value changed throughout the execution of the inner procedure. This is because the PL/SQL compiler detected that the the TO_NUMBER function was redundant and optimized it out during the compilation process. That left just a parameter input of “glob_var” which could then be passed by reference. Bottom line – it’s generally considered poor programming practice in any language to be mix and matching the scope of variables, in this case, using glob_var both within and outside the inner procedure. Trying to subvert the behaviour of the PL/SQL engine by using expressions such as to_char(glob_var) is a recipe for disaster. 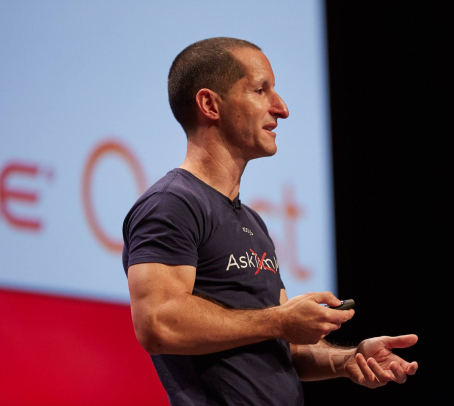 Who knows what additional optimizations the next release of the PL/SQL compiler will have? Perhaps it will optimize out “glob_val+1” or to_char(glob_var) and hence pass them by reference etc. If your functionality really demands on coding with these blurred scopes, then make sure you perform an assignment to a local variable and pass that to avoid unexpected side-effects. I guess an [IN] COPY extension would only obfuscate more.